Our school canteen is a tremendous asset to our school. It is always a pleasure to note students of all ages mixing over lunch in a warm and comfortable space. We are especially pleased that healthy nutritious food is available every day and students avail of the affordable meals provided. During morning break and lunch breaks the students can avail of a selection of daily specials, together with a selection wraps, rolls, soup, fresh salads, etc. Triona and her staff work closely with the staff in Coláiste Mhuire Co-Ed to encourage a healthy eating policy amongst the students. No fizzy drinks are sold. Coláiste Mhuire Co-Ed offers state of the art sporting facilities. In our sports “Dome” situated on our campus we have a high performance gym and weights room and a multi-sport indoor arena with spacious male and female changing area. Our outdoor facilities include a full sized Gaelic pitch, soccer field, hurling wall and hard-court area. 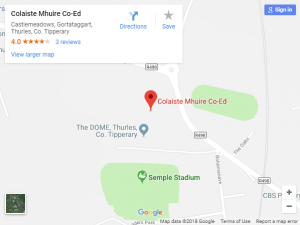 At Coláiste Mhurie Co-Ed we offer a wide range of sporting activities including hurling, camogie, Gaelic football, volleyball, soccer, table tennis, athletics, badminton, orienteering, basketball, tennis and squash. Other activities are catered for upon interest. At Coláiste Mhuire Co-Ed we maintain a high level of participation in Munster and All-Ireland competitions. To complement the external competitions we organise many internal class leagues in sports such as hurling soccer and table tennis. At Coláiste Mhuire Co-Ed we recognise the challenges that face us in preparing our students for the “Information Age” and entering a “Knowledge Economy” and are confident that our facilities allow our students to develop these vital skills. We have four computer suites and a variety of educational technology resources to enhance and support student learning. We are continually embracing the technological revolution and have been involved in pilot programmes to integrate Moodle virtual learning into our school. Our Science, Home Economics, Metalwork, Woodwork and Art rooms are exceptionally well equipped and maintained. As a school we are always striving to enhance our facilities. With this in mind we are currently working on our Learning Resource Centre.